Towards the end of World War 1, in 1917, the Royal Flying Corps requisitioned 160 acres of farmland near the village of Upwood, Cambridgshire. In September of that year the station opened as Bury (Ramsey). Initially the No. 75 Squadron, flying BE.2 aircraft out of nearby the Elmswell Airfield in Suffolk used the station as a night-landing ground and satellite field. By the summer of 1918 a number of huts and five hangars had been built at the airfield, it was around this time that the field was renamed Upwood. In July 1918, No. 191 Training Squadron moved to Upwood. In addition to BE.2s, 191 NTS also flew the de Havilland DH.6. Whilst at Upwood they converted to the FE.2b. Later that year in October 1918, the No. 190 Training Squadron arrived. When the First World War ended in 1918, the squadrons were no longer required and disbanded in the middle of 1919; the airfield was returned to the local community and the buildings demolished. After a review of the air defence capabilities by the UK government, a major expansion of the Royal Air Force was subsequently announced in 1934 and resulted the opening of many new airfields over the remainder of the decade. One of these new airfields was RAF Upwood. The old First World War airfield site was selected to be reactivated and expanded. The new station was designed to accommodate two medium bomber squadrons with room for a third. By 1936, construction had begun in earnest with two of five C-type hangars started. RAF Upwood built to the same design as other airfields built in the Thirties with standardised technical and domestic areas. Due to concerns by the local communities regarding the intrusion of the new airfields into the countryside, the domestic buildings were built in neo-Georgian style. RAF Upwood also features tree-lined roads and widely spaced buildings to guard against bombing giving a campus-like quality. On 27 February 1937 the first flying unit arrived at Upwood in the form of No. 52 Squadron RAF flying Hawker Hinds. This unit was joined on 1 March 1937 by No. 63 Squadron and its Hawker Audaxes. During their time at Upwood, both Squadrons became training units and in later 1939, the two squadrons were reassigned to allow No. 90 Squadron flying Bristol Blenheims to be stationed there. At the start of World War II, the No. 90 squadron took part in air-to-air firing and bombing practice. They were joined in February 1940 by another medium bomber unit, No. 35 Squadron, flying both Blenheims and Ansons. The squadrons based at RAF Upwood were merged in 1940 to form the new No. 17 Operational Training Unit. In 1943, the government took to opportunity to upgrade the grass runways to concrete ones after the stationed units were upgraded to Vickers Wellingtons had to be relocated to RAF Silverstone due concerns with the suitability of the existing runways. The first flying unit to use the new runways at Upwood was No 139 Squadron flying De Havilland Mosquitoes. They arrived in January 1944 and flew their first mission shortly after. In March 1944, RAF Upwood became home to No 156 Squadron and its Avro Lancasters, who undertook their first mission later that month. At its wartime peak, the station had a working population of over 2,500 people. A total of 210 aircrew from the two squadrons were killed as a result of operations. The airfield continued to operate after World War II with a number of units rotating through, each providing support for the British Empire in the aftermath of WWII and the Independence of India. From the middle of the 1950s, RAF Upwood transitioned to a fighting airbase and provided a support role to the anti-communists operations in Malaysia, based out of RAF Tengah in Singapore. The Units based at RAF Upwood also provided support to Mau Mau operations in Kenya around the same time. In 1955 the Avro Lincolns were retired and replaced by English Electric Canberras. The Canberras provided flight operations to Cyprus in support of Operation Alacrity; this was the first combat operation role RAF Upwood had provided since the war. The next two years saw a series of unit disbandments and arrivals culminating in a slow winding down of flying operations at Upwood. Between 1957 and 1961 the flying units at RAF Upwood were disbanded and the airfield took on a new role. After the last unit was disbanded from RAF Upwood, the airfield was transferred to RAF Strike Command who quickly set about transforming the airfield into a hub of various support activities. Over the next several months the station became home to the Ground Radio Servicing Section, Radio Technical Publications Squadron, the Aeromedical Training Centre, the Joint School of Photographic Interpretation and three squadrons of HQ No 33 Field Wing, RAF Regiment. The different units had barely settled in when change came again. In early 1963 the RAF Regiment units departed. In 1964 the other units left as well, leaving Upwood with only a token care-taker staff. Early in 1964, 22 Group of Technical Training Command arrived and set up their School of Management and Work Study. July saw the arrival of the School of Education and the RAF Central Library, followed in September by the School of Administration. RAF Upwood was again becoming focused on training. Later training units included the Equipment Officers Training Centre and the Air Cadet Training Centre.These various training activities lasted, in one form or another, until the late 1970s. By 1981, the station was again almost dormant. With the end of RAF use of the station in 1981, the United States Air Force was given control of Upwood by the Ministry of Defence. USAF airmen from RAF Alconbury had been living in the Upwood housing area since the mid-1970s, however when the 10th Tactical Reconnaissance Wing took over as the host unit in December 1981, it started a whole new round of activity. RAF Upwood soon became a satellite station of RAF Alconbury, providing housing and support services for personnel stationed there. In May 1986, all contracting support services moved from RAF Alconbury to the Headquarters building at RAF Upwood. In 1986, a multimillion-dollar medical facility was opened to provide out-patient services to American military members and dependents in the area. RAD Upwood was also home to the USAF UK campus for the NCO Academy and NCO Leadership School for USAF enlisted Professional Military Education. The Department of Defense Dependent Schools operated numerous buildings as classrooms for dependent children on RAF Upwood. In the event of a Non-combatant Evacuation Order, dependents would be evacuated from the base, and the buildings would be converted into a contingency hospital with suppies and equipment stored in a climate-controlled hangar on the base. With the end of the Cold War in 1991, and the phased rundown of RAF Alconbury beginning in 1994, the USAF activities at Upwood were curtailed. 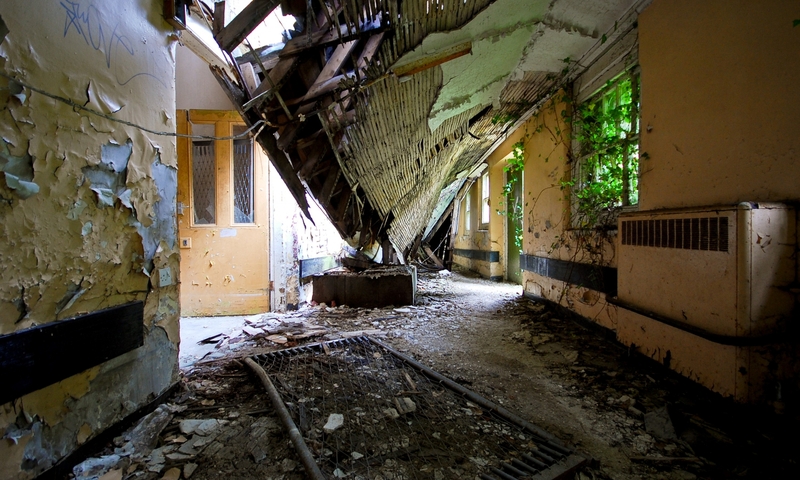 RAF Upwood was returned to the British government control in September 1995 and with the number of airmen assigned to the area reduced, the need for housing became less and less. By 2005 the last USAF family moved out of the Upwood housing area and it was returned to the MOD.In October 2012 RAF Upwood 423rd MDS closed its door to patients for the last time and merged with its sister station and became part of RAF Alconbury. In 1999 the entire NCO married quarter estate including both prewar and post housing and the former NAAFI building were sold to The Welbeck Estate Group and underwent a major upgrading. The Technical Airbase of the airfield was split; the C-Type Hangars were purchased by Turbine Motor works. The accommodation block / technical area is currently used for Airsoft games.